With 8 years of president ship behind him, Barack Obama successfully reduced the unemployment rate to below 5%, a monumental success given that he took office when the country was facing its greatest economic downward spiral. But is that all? There are indeed many states, who have really pushed their limits. After exploring the most friendliest States for starting a new business, here’s our take on the top cities with the lowest unemployment rate, packed with one of the lowest tax rates, better housing facilities, and low business costs too. They are truly the new sunshine states, in the most literate sense of the word. The US, in its record since the 2008 economic crisis has hit the lowest unemployment rates in other specifics too, with a record low veteran and teenage unemployment rates. Let’s examine why these states apart from having the lowest unemployment rates, can also be the best places to raise a family, consequently ticking all the right boxes. Cities within the state of Texas, Utah, Nebraska and North Dakota easily from our top picks. It is a more than a decent mixture of ingredients, encompassing, low tax rates, good education system, state-backed innovative programs, high civilian employable population combined with lowest unemployment rates, all consistent over the years, and business friendly too. These factors are what increasingly matter to most people looking to establish a foothold in an urban set-up. In places like Lincoln and Omaha, Nebraska, there is incredibly low unemployment rate combined with high civilian workable population. Lincoln, as a city, stands at third place, with 3.3% of unemployment rate with a civilian labor force of 177,377 as of July 2016. Its economy is highly reliant on its primary, agricultural sector, freight transport, telecommunications, manufacturing industries, information technology, including the transportation sector. Close to one-third of its population possess a bachelor degree, making it a highly competitive labor market when compared against other states whose educational qualification lie in between one-fourth or 25%. Nebraska’s State Department of Labor is also well-known for its efforts to train eligible unemployed populace with skill sets that help increase their prospects of finding a new or a better job. Benefit schemes in the State of Nebraska are also one of the most sought-after, for they provide unemployment benefits from 1 week to 26 weeks. As computed by Gallup Daily Tracking, Nebraska is found to have one of the highest job-creation indexes at 35 and its track record boasts of the lowest of all percentages of ‘letting-go workers’ which stands at 8. Similarly, Logan, Utah with a Civilian Labor Force of 67, 870 has an unemployment rate of 4.0%. Utah seems to have understood that to create a favorable environment for employees to stay, it is not enough to just create a welcoming business environment. In addition, it should be a place where they can picture themselves settling down to raise their families and go on living. To fulfil these aspects, Utah has spent a lot of money trying to make people favor them into believing they have the best of class housing facilities and can provide an overall good quality of life, which they do! Utah also benefits from having a high number of colleges both in terms of favoring graduates and also families looking for a secure place of education. 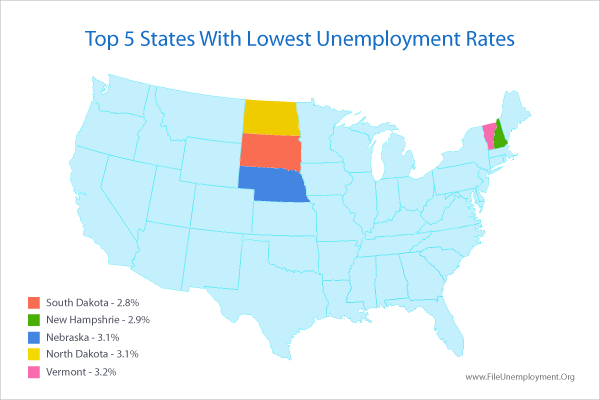 Our third favorite is North Dakota with highly prosperous cities like Bismarck which with a civilian labor force of 62,242 stands first with an unemployment rate of 2.9% (when ranked against cities). The cost of living charges closely follows national average with the national average cost of living index at 100. While Fargo is one the most prosperous of its cities with overall costs of living lower than the national average, Bismarck has a slightly above average for groceries, housing, and health with below average indices for transportation, and utilities. A study combined with the tools of research correlating tax incentive programs (including tax rates) to unemployment rates are found to be having a direct relationship to each other. After evaluating the census data of a particular state (as published in the Review of Regional Studies by Kala Seetharam Sridhar), that post implementation of tax incentive programs, over time, effectively impacts the unemployment rate. When a city turns into an enterprising zone, welcoming new businesses and creating an environment which entices them, can at the end of a year, approximately affect up to 3% of its unemployment rates. This can easily be the case with the cities within Texas. It is not one or two, but a numerous number of cities that have qualified into being one of the most business-friendly of states, not to forget the least tax rates too. Odessa, Texas, with a civilian labor force of 83, 418 has an unemployment rate of 3.9% and Midland, with a Civilian Labor Force of 87, 857 has an unemployment rate of 3.3%. Texas though has a very high record in terms of percentage of hiring new workers at 44%, it is job creation index falls a little short at 31 though still holds itself at the national average. Why Is It Important To Pick From The Best American Cities? Politics of fear has been the defining criteria for developing a fixed perception that America has been damaged internally with an increase in export of jobs through MNCs looking to setting up enterprises abroad. But real stats have a way of breaking these myths circulating around, as, in the past 10 years, U.S. has created 10 million jobs with a few hundred thousands of jobs still being created every month. July saw 255,000 new jobs being added to the market, while the figure has been consistent for the past few months too. In short, this may be some of the best times to live in for the labor market has met its surplus with a tenacity not seen since the Reagan days. If you are one to be unemployed and are looking for alternate options at securing a job, we hope to have answered all your questions. File Unemployment is one place where you can get answers on, eligibility criteria, benefit amount calculation, weekly and other benefit schemes from all States in the U.S. Go and check out our Community forums to get instantaneous answers to your queries, by both people who have received benefits as well as our experts in the field.